Shaun Murphy scored a dramatic 4-3 win over Ben Woollaston to reach the semi-finals of the Ladbrokes Players Championship and keep alive his hopes of back-to-back ranking titles. 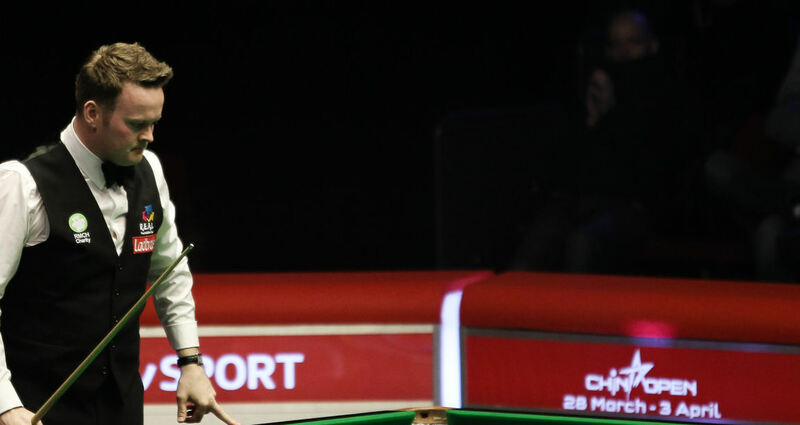 Murphy won a tense deciding frame on the final blue to set up a semi-final meeting with Mark Allen in Manchester. If Murphy goes all the way to the title on Sunday he’ll win consecutive ranking titles for the first time in his career – having captured the World Grand Prix two weeks ago – and take his earnings for March to £200,000. World number four Murphy looked in control in the early stages and led 2-0 and 3-1 with top breaks of 65 and 52. But Leicester’s Woollaston made a 60 in frame five and took the next as well to recover to 3-3. Both players had several chances in the decider and when Woollaston missed a tricky pot on the penultimate red to a top corner, Murphy looked set to clear. Surprisingly he failed to pot the final blue when leading by 13 points, but he was fortunate to get another chance and clipped a thin cut on the blue into a centre pocket. Allen enjoyed a comfortable 4-1 win over Mike Dunn with a top break of 61. Dunn won the second frame on the black but struggled to settle into the match and Allen ground out the victory. It’s the Northern Irishman’s second ranking semi-final of 2016 having reached the same stage of the Welsh Open. “I got to four frames and that was all that mattered,” said world number ten Allen. “Mike will be disappointed by the way he played because it was a big match for him. No disrespect to him but I expected to win and perhaps that affected me. I felt a bit flat when I prefer to have a few nerves and feel edgy. I had chances to put the match to bed earlier but I got there in the end.